Billy Batson wants to know what people think about what Superman and the other heroes have been doing. He talks to several people, and they don't all agree. But either way Billy's not comfortable with the things Shazam has done, and he's trying to figure it out. The day before, Black Adam was on a rampage. But he was stopped when Wonder Woman, lasso of truth around his throat, forced Adam to say his magic word and revert to his mortal, and terribly ancient, form (so ancient that Shazam says he doesn't know whether Adam will survive the transformation) just as he's nearly begging "Billy" to promise that his home of Kahndaq will be safe. In the aftermath, Shazam tries to reassure a civilian man and his two children that the danger has passed, but the man rebukes Shazam, telling him he is just another of the "angry gods" who does not understand them and that he should "go back to [his] skies." Eventually, Billy, realizing that he can understand, conducts a final interview. Story - 4: "Fatality!" says that one half-hidden hipster, in the most blatant (but not entirely unwelcome) bit of pure advertising this book has so far committed. It's supposed to be an in-joke, and I get it. But naturally it also calls attention to the book's true nature as one long advertisement, which always makes me feel, reviewing it, a little dirty. I mean, as a bit of a joke I almost reviewed that horrible, awful, stupid "Craftsman Saves the Justice League" or whatever thing a few months back - and by almost I mean I downloaded it and read it but couldn't bring myself to have to think about it in ways or for durations sufficient to analyze and opine thereupon. It all just seemed so blindingly obviously bad. Not so much, this issue. 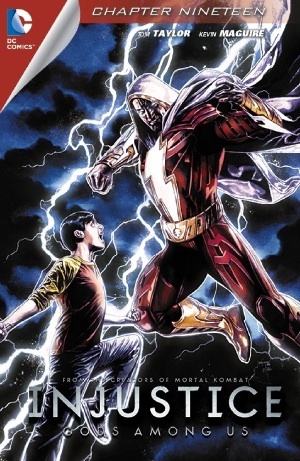 For the most part, this is an earnest attempt to interrogate the moral landscape of the story using not only one of the transgressing "heroes" (Shazam) in his much more sympathetic form (Billy, and thus a smart choice, overall) but also a classic juxtaposition of the hero's interviews with the comparative high-action playing out of the topic of those interviews (i.e., the fallout from the heroes' transgression) that completes in a kind of convergence of interrogation and action as Billy's "interview" with Shazam - i.e., with himself. Structurally, this is somewhat simple and near-cliché (with the juxtaposed action) but, just the same, time-tested and good, and especially good with the convergence of interviewer and interviewee and the end. This in particular is a smart choice, and warrants appropriate approbation. You'll note of course that I'm going ahead and calling it transgression, what Superman and friends have been up to in this (secret) alternate dimension, rather than waiting for the story to pronounce it once and for all, which it probably won't ever do (and rather than being snarky about it, ya dig?). And that's partly ok, in a journey-not-the-destination sense. On some level, we're surely meant to just know that this no-holds-barred approach to solving worldwide conflict is wrong (because, if you've played the game or watched the two-hours of cut scenes, you know this really is how things cash out). What's more, I've been hoping that something like this would happen - direct posing of the question: "Is what Superman is doing bad or good?" Not just seeing it taken for granted on each side of the answer. And while these interviewees are a largely trite and predictable lot, the Muslim woman's final line ("There would be no better life to be found.") stands out for its elegant framing of the end game. If the point of the Black Adam fight is to show that the "heroes" are on the path to turn into their own versions of Adam's evil (up to and including the eventual forced removal of their power), then the point of the interviews is to at least begin to show that this change in the good guys' tactics is beginning to change the world itself. And yet, despite that little distraction, the ending works. Where at the outset you have a big question of universal ethics, what you're left with is the rather smaller question of whether Shazam will join Batman. But just as the convergence of interviewer and interviewee in Billy/Shazam mirrors the projected convergence of Superman (et al) and Black Adam, Billy's implied answer to his own question mirrors the story's answer to the universal version we started with: the "heroes" are wrong. My only beef is that we haven't really advanced anything, in the larger scheme. We already know what the moral of this tale is. Thus, sadly, this nice and occasionally intricate piece of work (that I am still going to grade highly) got us exactly nowhere. Pity. Art - 3: I did not much appreciate these pencils. Too cartoonish in some places (Wonder Woman jumping on Black Adam's back at an angle and posture too preposterous to be entertained), too lazy in others (the entire three-horizontal-panel page during the Black Adam fight where Superman helps Wonder Woman pin Adam), and outright grotesque at times (Black Adam tearing off Cyborg's arm - look at Adam's face... yikes). The overall panel arrangement, however, I did appreciate (and the faces in the vertically framed interview panels were pretty excellent), even if more than anything this work gives off a kind of both immature and uncontrolled vibe that I can't tell whether it's by design or not. Partly that's because the fact of rotating pencillers imparts a sense of visual inconsistency to the entire series, but either way it's as good as "not intentional" if I can't tell. Cover Art - 3: I assume we're going to see more of both Shazam and Billy in the next couple of issues. Indeed, I won't be surprised if Billy chooses not to join Batman but to stop being Shazam. That would be something. Artistically, this cover is ok - it's better than I could do (not a terribly difficult feat, I'll admit), but, at the end of the day, it doesn't really pose any questions and thus isn't very interesting.